It doesn’t take a rocket scientist to figure out why Christ, the son of God, came to earth to live among the simple and ordinary. It was role modeling at its best. Reconsider the first scene in God’s Son life …the whole manger setting, for the birth of Christ, is minimalism at its finest…only the barest necessities needed to welcome the birth of our Saviour. Anything more than needed would have been wasted. He wasn’t deserving of all the presents because he was a bully; but he could get away with his misbehavior because his daddy was a very important person and the teachers and nannies were afraid of him. He grew up to be a bigger bully, inheriting all his family’s wealth… so his children got everything they wanted at Christmas too.” The End. Not exactly the memorable story the congregation would want to hear…where are the problems, the struggle, the consequences of personal decisions…the lesson to the story? In other words…to follow in Christ’s foot steps. As I thought about a picture that might symbolize finding God in the simple and ordinary…my mind flashed back to a photo Joan (a couple of weeks ago) sent among her paintings. She had typed underneath this one that the photo was one of her favorites. 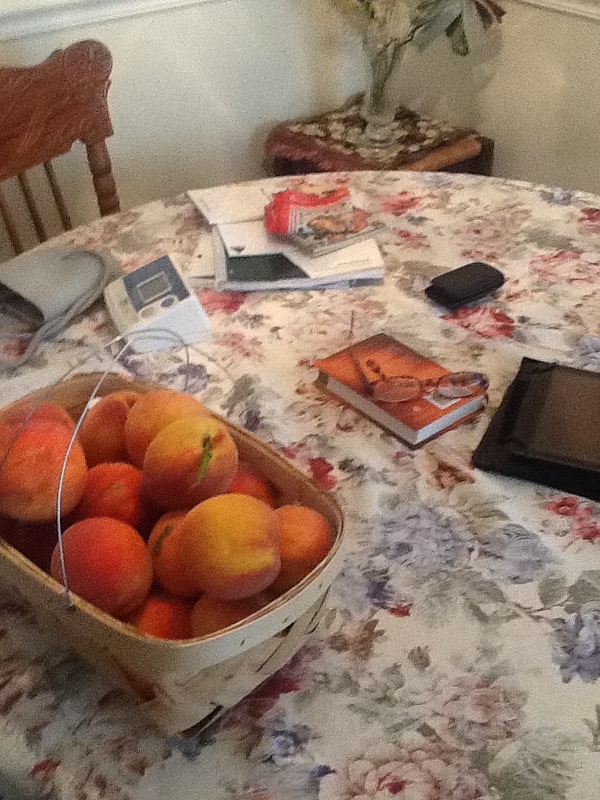 It was taken last summer…Joan’s elderly mother had gotten some peaches and told Joan to meet her at her house to share. When I first studied Joan’s photo I felt God’s Presence among this simple and ordinary. The basket of peaches does grab one’s attention first…from the beginning of China’s culture (land of the origin of peaches) they have stood for immortality. And the peach blossoms and wood?…. The Chinese also considered peach wood (t’ao-fu) protective against evil spirits, who held the peach in awe. In ancient China, peach-wood bows were used to shoot arrows in every direction in an effort to dispel evil. Peach-wood slips or carved pits served as amulets to protect a person’s life, safety, and health. It was a sense of peace that enveloped me when I looked at the photo of a simple, ordinary scene of daily life…a blood pressure monitor (ready to use each morning) a stack of correspondence with a package of crackers on top…(I always need chocolate when I pay bills) and then….and then…a pair of reading glasses on top of a book…could it be…it was (upon telephoning Joan) her mother’s daily devotional…Jesus Calling! Suddenly I had a feeling that November 29’s devotional had a special message for me…about finding God in the simple and ordinary…and continuing to trust in Him… while adjusting to the new changes in the blog. I was not disappointed. God must have decided it was time to add a new God’s Wink to Chapel of Hope Stories Pt. II. “Let me infuse My Peace into your innermost being…You can sense my Presence and my Peace growing within you…opening up yourself to receive My blessings. People today find it hard to acknowledge their neediness. However, I have taken you along a path that has highlighted your need for Me; placing you in situations where your strengths were irrelevant and your weaknesses glaringly evident. …You have discovered flowers of Peach (I mis-typed Peace…humm…another God’s wink?) Peace blossoming in the most desolate places. You have learned to thank Me for hard times and difficult journeys, trusting that through them I accomplish my best work. You have realized that needing Me is the key to knowing Me intimately, which is the gift above all gifts. So until tomorrow…I will now put on my jacket and scarf…walk through my garden and then my neighborhood…discovering God in my simple and ordinary life…pausing to thank Him for the journey. * One way to find peace is on the face of ones we love. Joan sent this sweet picture of Jake before they headed back home yesterday. 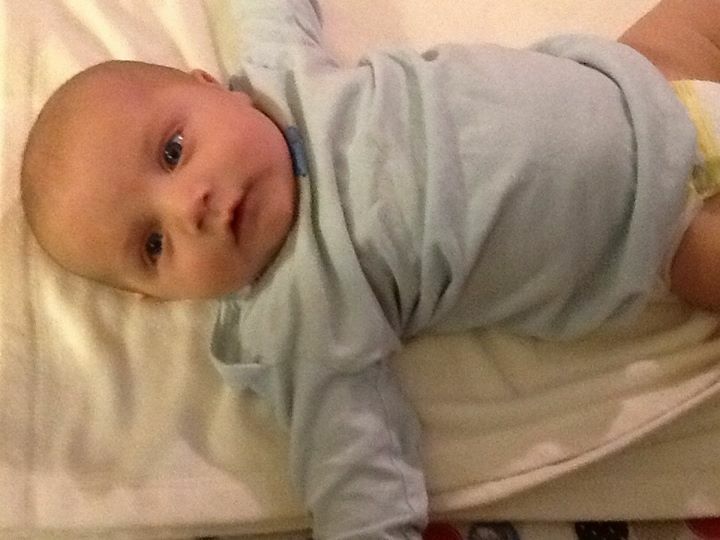 He turned two months November 24. Thanks Becky! Just what I needed this day! Thanks for the reminder to look for God in simple and ordinary! An extraordinary God in ordinary surroundings….we must remember to keep it simple! So good to hear from you my friend! As a Christmas gift…would you tell (just in general) how you found Chapel of Hope stories…and your journey through us…the readers love you…and would love to hear some of your story.